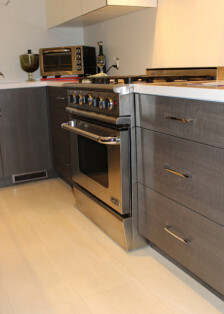 With so many new materials and finishes becoming available to the cabinetry industry over the last couple of years, contemporary kitchen design has really taken hold of the new construction and renovation market. While planning a renovation, our customer created a list of needs for their new kitchen. 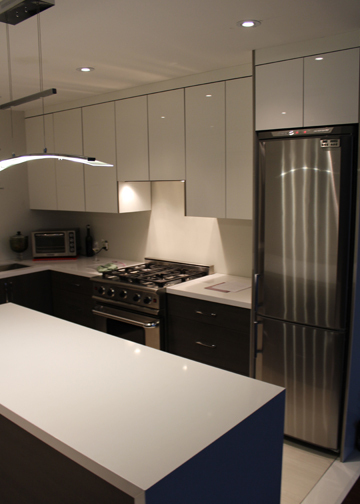 They wanted a contemporary kitchen design and really liked the idea of mixing finishes, more specifically a darker wood finish for lower cabinets and white high gloss finish for upper cabinets. 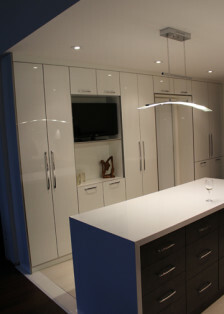 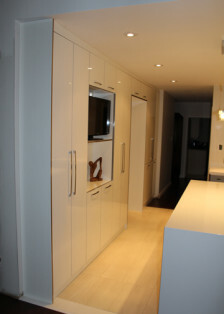 They required lot of pantry storage and they also wanted a centre island. On the wall that would house the pantry, they needed a door to be installed but the home’s floor plan didn’t allow for a regular hinge door that would open into the kitchen or into the adjoining room. After a design consultation, a process of revisions and material selections, we undertook the project and the following pictures show how the project turned out. 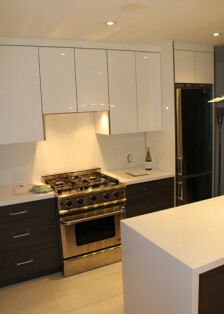 The two tone cabinets with white uppers and darker wood finish lowers are perfectly matched with the white wall colour and light tile floors. 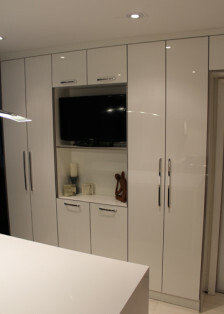 The chrome handles and high gloss door finish add a luxurious feel to space and are easy to maintain. 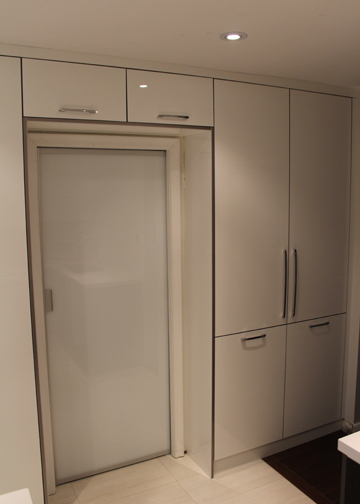 The sliding pocket door with back painted white glass adds a design element to the pantry wall. 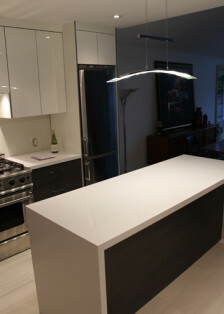 The centre island with drawer storage on one side and seating space on the other was finished with Cesarstone (Quartz) and has a waterfall design where the top and sides are joined and finished to make it look like one solid piece. Browse through our online contemporary kitchen CATALOGUE for more details and product specifications or Contact Us if you would like more information on this other Komandor products.